I had a wonderful evening in class today. First, we got to work in teams to create an item that would house and protect an egg from breaking when we threw it from the ceiling. Trust me, it was not easy when there are six people trying to weigh in with their opinions and settle on an idea and turn that into reality within 20 minutes. But it was fun to feel included and useful after such a long time. Side note: Our idea consisted of using balloons to surround the egg as a protective shell. I never knew blowing a balloon was so damn difficult. For the first five minutes, I was essentially spitting saliva into the balloon. I don’t think I will be giving anyone balloons as a gift anytime soon. Ok back to the main story. So we all got to put an egg into our “artwork” and drop it off the ceiling. A sense of trepidation spread through the crowd. We all half-wanted the egg to not break and yet we were nervously excited to see an eggy mess on the floor. By the time the last team threw their project on the floor, we were cheering on for every single egg that emerged unscathed from their short flight. Out of 12 contenders, only five survived the fall. But really, what made me behaved like a giggly kid all over again was seeing the paper ninja stars (pictured above) in class. 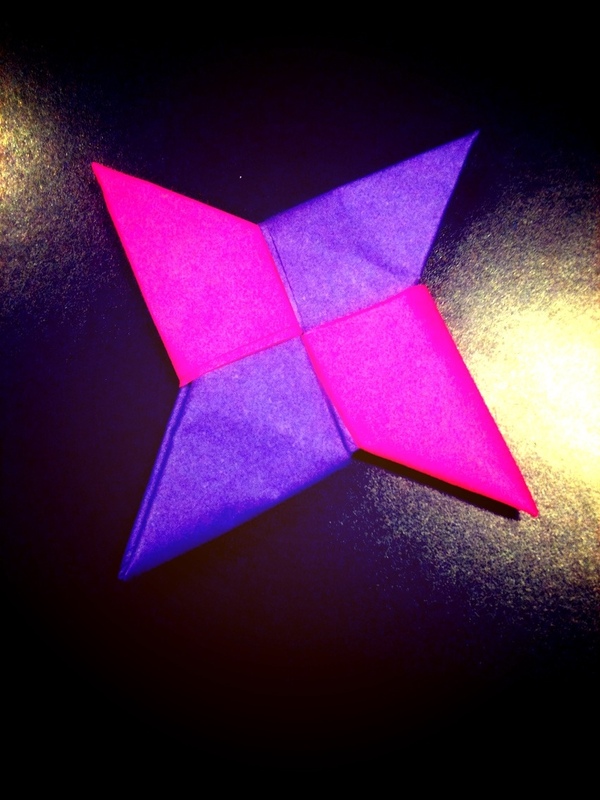 Someone had made the exact replica of the ninja stars I used to lovingly make when I was five years old. I’d make a bunch of them with square coloured papers (something that you don’t see in stationery shops these days) and start carrying a stack of multicoloured ninja stars around pretending to throw them like how a ninja would. They were my favourite toys. Then one day, I grew up and like how most adults treat toys, I stopped playing with my ninja stars and soon I forgot how to make them. Over the years, I have always wanted to recreate them but I never remember the right ways to fold the paper. Until tonight.